Impressive and very decorative papier mâché sewing cabinet painted with images taken from the book The Beauties of the Bosphorous, by Julia Pardoe, and illustrated by William Henry Bartlett, published in 1838. The top of the cabinet shows the ‘Palace of the Sweet Waters’, and the front is taken from ‘The Grand Bazaar, Constantinople’. The sides of the cabinet show on the right details from ‘Kaimac Shop in the Tchartchi Market’, and on the left, details from ‘Cistern of Bin-Veber- Direg’ or ‘the Thousand and One’. Opening the lid reveals a pink silk lined tray and a removable tool tray. The doors open to reveal eight painted drawers depicting exotic flora and fauna. Stands on four bun feet. With working lock and tasselled key. 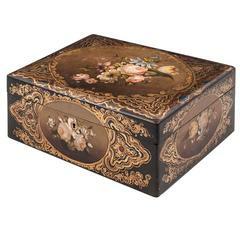 Early 20th century black papier-mâché chinoiserie box with hand-painted polychrome and gilt detailing. No makers mark. Jennens & Bettridge papier mâché tea caddy. 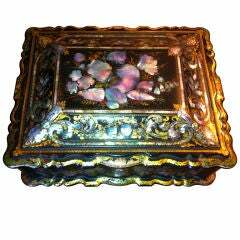 Beautiful Japanese Papier Mâché hand painted and lacquered box, stamped and signed (unrecognised). Measures: 18/24/10 cm. A Regency papier mâché snuff box with a painting of a lady wearing an elaborate headdress.